(Photo: Ecumenical News / Peter Kenny)The secretary general of the World Council of Churches, Rev. 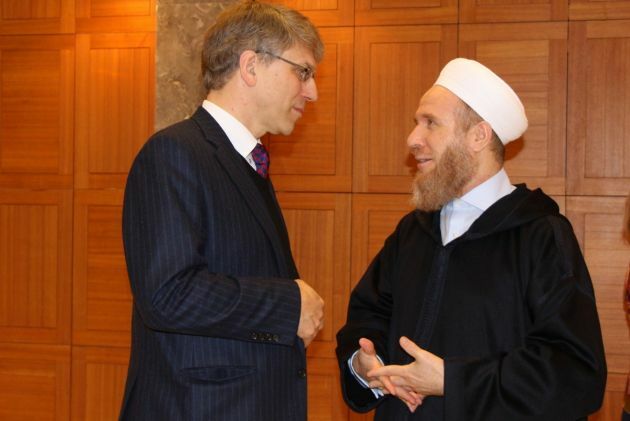 Olav Fykse Tveit talks with Syrian opposition Islamic leader Sheikh Mohammad Abdel-Hady al-Yaaqubi at the Ecumenical Center in Geneva, Switzerland on February 14, 2014. "The meticulous, detailed and scholarly rebuttal of the claims of the IS to represent authentic Islam offered by this letter will be an important resource for Muslim leaders who seek to enable people of all religions to live together with dignity, respecting our common humanity," said Tveit. "I am especially concerned at present for the safety and flourishing of Christian communities in the Middle East, as well as in other continents," he said in a statement. The Muslim leaders' letter says "It is forbidden in Islam to kill the innocent. "It is forbidden in Islam to kill emissaries, ambassadors, and diplomats; hence it is forbidden to kill journalists and aid workers." Among a host of other issues the letter says "Jihad in Islam is defensive war. It is not permissible without the right cause, the right purpose and without the right rules of conduct." "We look forward to continuing to collaborate with our key Muslim friends and partners, a number of whom are signatories of this letter, to work together with them for peace and justice throughout the Middle East and in other parts of the world," Tveit said in his October 1 statement.